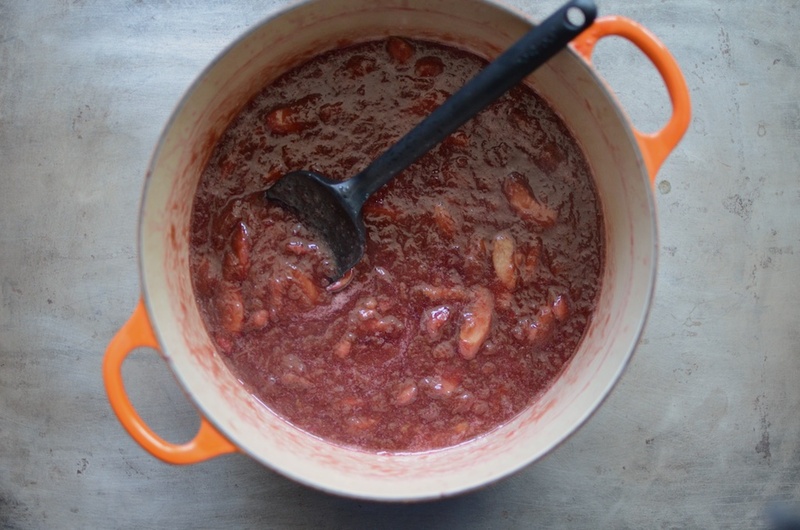 Want to see this Rhubarb Hibiscus Jam in action? Join me this Saturday, April 28 for a livestream demo on the Fillmore Container Facebook page. 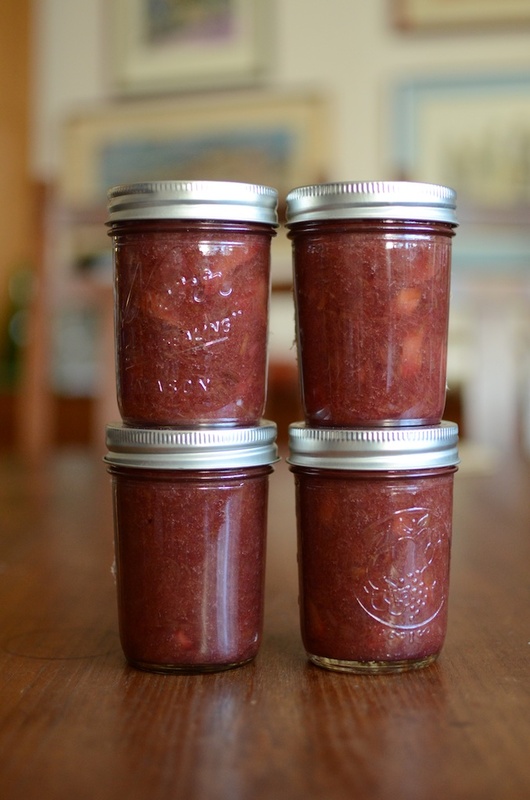 I’ll show you how to make it from start to finish and will answer all your canning questions! As I type, my living room windows are wide open to let in the light and air of spring (street noise and city dirt come along for the ride, but they’re a price I’m willing to pay at the moment). After what felt like an interminable winter, it’s such a relief to shuck off all the heavy, warming things for both clothes and foods that are crisper and lighter. 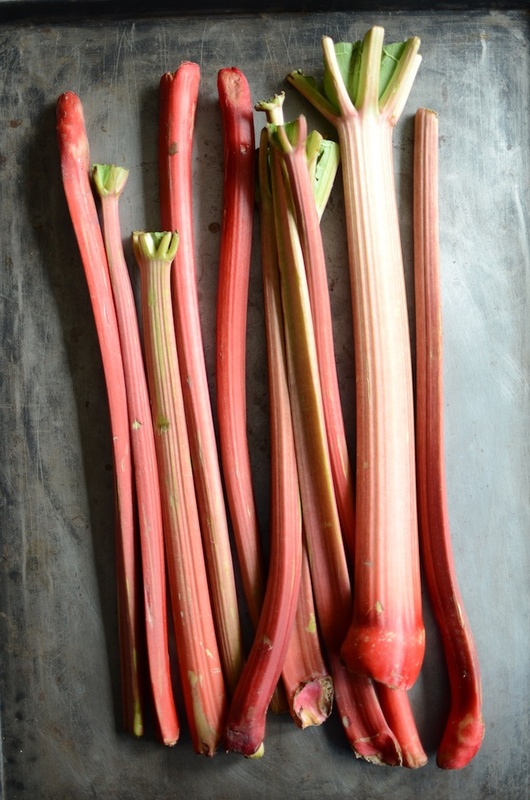 For me, the appearance of rhubarb is one of the most welcome signals that easier days are on the horizon. I spotted some while in Ireland earlier this month and kept my fingers tightly crossed that some would be waiting for me when I got home. And it was! Earlier this week, I scooped up two and a half pounds at my local produce market. As he rang up my total, the clerk asked me if I was going to be making a pie. When I told him it was destined for jam, he seemed a little disappointed (perhaps he was going to ask for a slice?). Once home, I cleaned the rhubarb, cut away the sad ends, and cut it all into half inch-wide slices. It filled my largest measuring cup, which felt just right in terms of the batch size I wanted. In years passed, I would often combine rhubarb with a fresh vanilla bean, but because vanilla is so scarce and expensive these days, I reached for my jar of dried hibiscus flowers, instead. I had a feeling they would compliment the tartness of the rhubarb and would help enhance its ruby glow. I combined most of the rhubarb with two cups of sugar and 1/4 cup of the hibiscus flowers (they went into my biggest tea ball, but cheesecloth would also work) and let it all macerate overnight. I held about 1/2 cup of the rhubarb back from the pot, to stir in at the end. Rhubarb collapses as it cooks and I wanted the finished jam to have some texture. By holding some back to stir in at the very end, you end up with a bit more elemental rhubarbness in the jam. I did use a bit of Pomona’s Pectin to help bolster the set and help corral the runny juices. However, if you’re someone who prefers a softer set jam, you could leave it out. 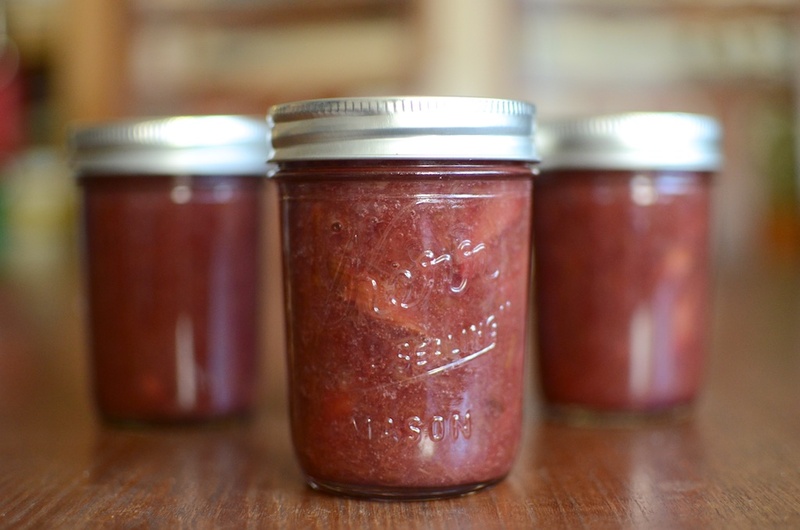 For those of you who like to learn by seeing rather than reading, I will be demonstrating how to make this jam this Saturday (April 28, 2018) at 7 pm eastern time on the Fillmore Container Facebook page. I’ll walk you through the process, show off those gorgeous new amber jars, and will answer all your questions live. 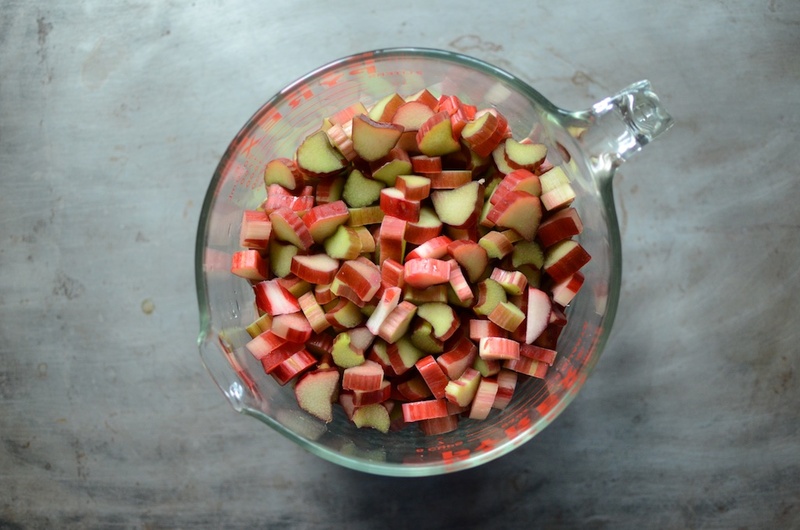 Wash the rhubarb and cut away any bad spots. Cut it into slices that are about 1/2 inch in width. 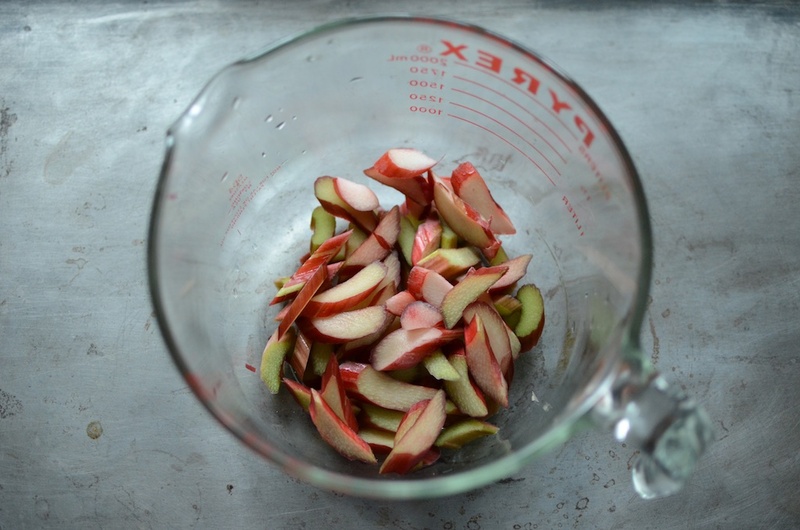 Measure out 1/2 cup of the sliced rhubarb and set it aside. Take the rest of the rhubarb and place it into a pot. Add 2 cups of sugar and stir to combine. Tuck the hibiscus into a tea ball or a length of cheesecloth and nestle it into the rhubarb. Let it macerate for at least three hours and up to 24 (I did mine overnight). When you're ready to cook, prepare a boiling water bath canner and four half pint jars. 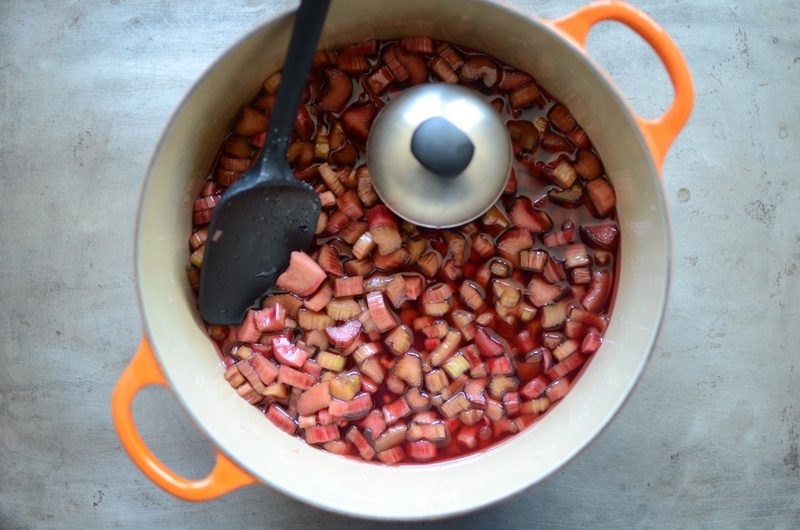 Place the pot with the rhubarb on the stove over high heat, add the calcium water, and bring to a boil. Cook, stirring regularly for 10 to 15 minutes, until the rhubarb starts to break down. If it's spitting, reduce the heat. Whisk the pectin powder into the remaining 2 tablespoons of sugar. Add this pectin-spiked sugar to the cooking jam in three stages, stirring well after each addition. Finally, stir in the reserved rhubarb. Cook for an addition 1 to 2 minutes. Remove the pot from the heat and fish out the hibiscus bundle or tea ball. Funnel the finished jam into the prepared jars, leaving 1/2 inch headspace. Sounds delicious! Do you think using a couple of bags of Tazo passion tea would work in place of the dried hibiscus flowers? I’m right there with Joy ^^^ – if one does not have dried hibiscus flowers would tea work? Yes! It would work beautifully. I imagine 2 or 3 teabags would give you a similar amount of flavor. Ooh! It looks delicious.I will definitely make this one.Thanks for sharing. Wondering if I could chop up the dried hibiscus and cook them right into the jam? I make a “marmalade” with dried hibiscus but have never canned it because I don’t know the ph.